As our population grows, so does our dem and for energy. Non-renewable energy is still our main source for our household needs. Unfortunately, this leads to environmental pollution, climate change, and even causes health problems. Be sure to use energy wisely to make the world cleaner and healthier. ENERGY STAR® is your partner in identifying the best ways to save energy by certifying a product’s energy efficiency. Renewal by Andersen® firmly supports this program by the Environmental Protection Agency. We promote this movement through our energy-efficient Chesterfield doors and windows. Energy efficiency is not visible to the naked eye. That’s why ENERGY STAR puts products through a series of testing and expert analysis. To make sure everything that has the blue label meets the highest st andards, every product undergoes a third party certification process. ENERGY STAR actively encourages companies and homeowners to take the pledge to save energy. Lower energy consumption decreases greenhouse gas emissions from power plants and drops your home’s carbon footprint. For your home improvement needs, trust an advocate Chesterfield, Missouri, windows company. At Renewal by Andersen of St. Louis, we continuously improve our processes to reduce our impact on the environment. Changing old windows with ENERGY STAR certified units lowers household energy bills by an average of 12% nationwide. For your replacement windows in Chesterfield, MO, choose a product that provides the best benefits. Renewal by Andersen windows have special glass coatings that create a thermal wall to keep wanted heat in your home. During hot seasons, our High-Performance™ Low-E4® glass blocks unwanted heat gain to keep your home cooler. Live a greener lifestyle with these products. 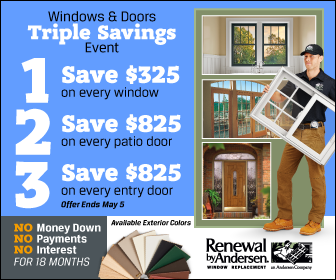 For more information, call Renewal by Andersen of St. Louis at (314) 332-2364.